When Punxsutawney Phil was unceremoniously yanked out of his burrow and didn't see his shadow, that meant it would be an early spring. Many here on the Alley were singing hallelujah as steelheaders I knew were fed up with the lack of fishing. 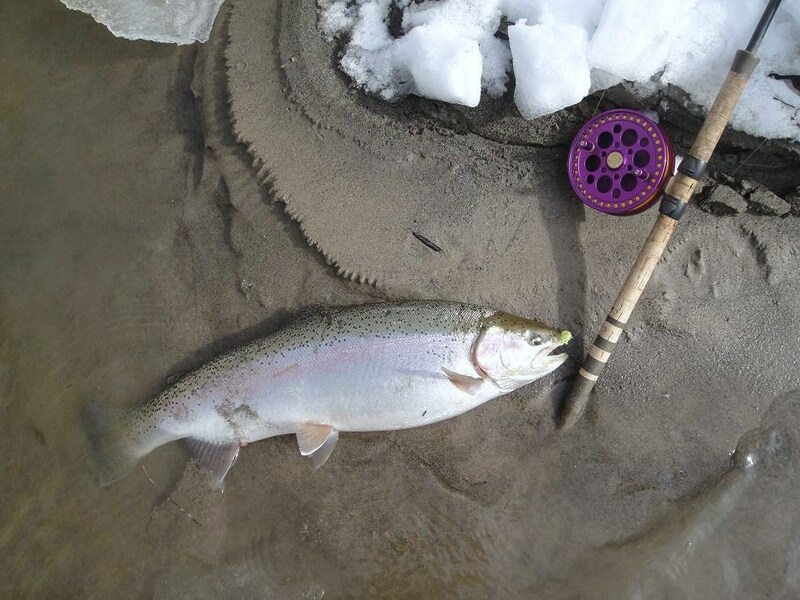 For some the diehards they were able to find any available water to fish and some had great days. Over the past few weeks I've been lurking the lower stretches of the Cuyahoga. Due to a pair of bald eagles nesting up river, some of the best sections are closed off for the rest of the season. That I never understood, as the national park doesn't seem to have a problem running the train near the nesting area, but god forbid that some angler wades quietly along the stream??? So far, it's been hit and miss as I'm still a little green on the river. But, it's another feather in the hat. Today was a decent day as I caught some nice fish and later I scouted another section farther down stream. The forecast for the upcoming week is calling for temps to be in the high 40s and possible rain. Driving through the Rocky River metro parkway, most of the river is still locked up in ice, But the ice is turning grey and side ice is melting away. As it gets warmer, more water will start to open up and that's were some people might get into trouble. In past years, I've seen some people literally stand right on the edge of side ice. That can be dangerous as it's difficult to gauge the thickness and your rolling the dice. I've been guilty of fishing on side ice but I also bring along a long landing net. The only problem I see is the ice is so thick, the ice will have no where to go and jams will create a lot of flooding downstream. The ice will also grind a lot of the banks away and that will result in very heavy sediment loads. 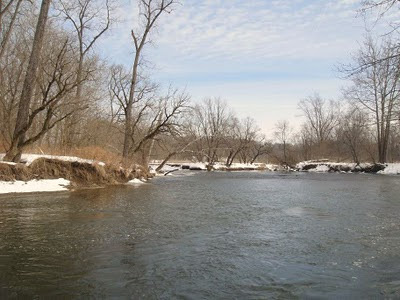 That usually means the rivers will be very dirty and fishing can be tough in those conditions.